296 Marlborough is located on the south side of Marlborough, between Fairfield and Gloucester, with 294 Marlborough to the east and 298 Marlborough to the west. 296 Marlborough was designed by L. Newcomb and Son (Edgar A. P. Newcomb), architects, and built in 1877-1878 by Goldthwait and Chapin, builders, one of two contiguous houses (294-296 Marlborough). The houses were built for Harvard law professor James Barr Ames for speculative sale. 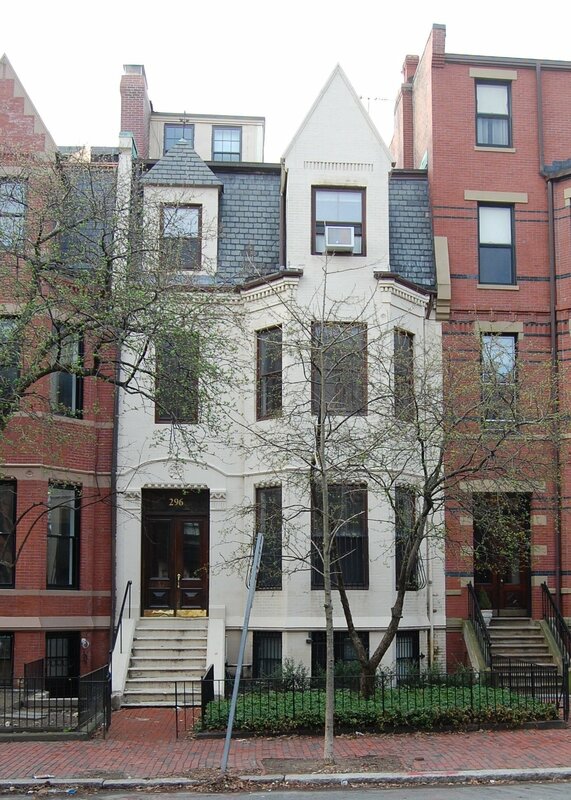 His father, Samuel Tarbell Ames, was a building contractor credited with having built over thirty residences in the Back Bay between 1879 and 1885. At about the same time as he designed 294-296 Marlborough, Edgar A. P. Newcomb also designed two houses for James B. Ames across the street, at 301–303 Marlborough, with similar distinctive peaked roofs on the bays. James B. Ames is shown as the owner on the original building permit application for 294-296 Marlborough, dated December 5, 1877, and on the final inspection report, dated October 8, 1878. He purchased the land for 294-296 Marlborough on December 1, 1877, from investment banker Henry Chapman Wainwright. The land originally was part of one of several parcels purchased from the Boston Water Power Company on January 29, 1866, by a real estate investment trust formed by John Templeman Coolidge, Franklin Evans, and Charles Henry Parker. The trust had subdivided the property into lots, which it sold to investors and builders, who then frequently resold the lots to others. Click here for an index to the deeds for 296 Marlborough. On December 17, 1878, 296 Marlborough was purchased from James B. Ames by Samuel Carr, Jr. He and his wife, Susan Waters (Tarbox) Carr, made it their home. They previously had lived at the Hotel Alexandra at 1759 Washington (at Massachusetts Avenue). Samuel Carr was Cashier of the National Hide and Leather Bank. In 1882, he was named president of the Central National Bank, and in 1883, he became secretary to Frederick Lothrop Ames, then the largest real estate owner in Boston. He subsequently became a trustee of the Ames Estate. Samuel Carr also was an organist and composer. The Carrs continued to live at 296 Marlborough during the 1901-1902 winter season, but moved thereafter to 403 Commonwealth . 296 Marlborough was not listed in the 1903 Blue Book. On February 28, 1903, it was purchased from Samuel Carr by Alice Brackett (White) Coolidge, the wife of cotton dealer Francis Lowell Coolidge. They previously had lived in an apartment at 362 Commonwealth. They also maintained a home in Milton. Alice Coolidge died in December of 1927. 296 Marlborough subsequently was held in a trust established under her will for the benefit of Francis Coolidge. He continued to live there until his death in September of 1942. 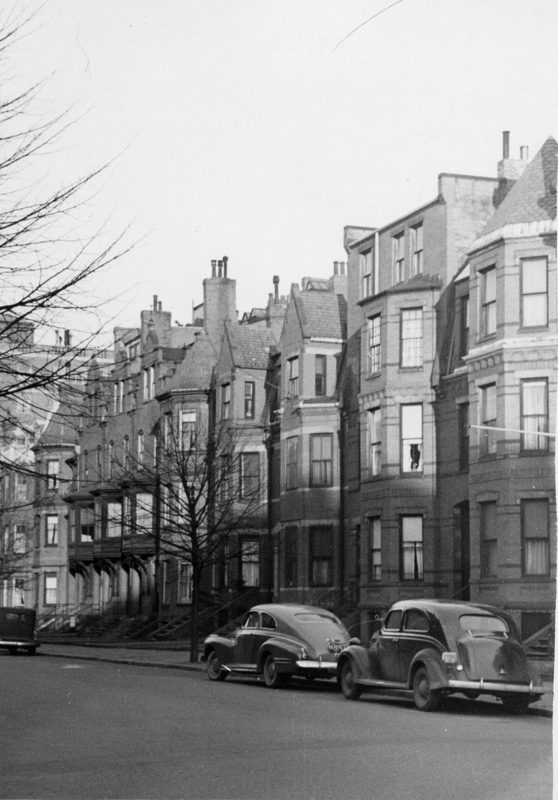 On December 24, 1942, 296 Marlborough was acquired from the trust established under Alice Coolidge’s will by real estate dealer Ray C. Johnson, who conveyed the property on the same day to Roger DiPesa. 296 Marlborough was shown as vacant in the 1943 City Directory. By 1945, 296 Marlborough had been converted into a multiple dwelling, either a lodging house or apartments. The property changed hand and on September 1, 1949, was acquired by Mrs. Edna Mae (Reynolds) Candage Lovejoy Walsh Grant. She was the former wife of Henry (Harry) Wells Candage, the widow of Everett John Lovejoy and Dr. William Martin Walsh, and the former wife of Wallace Edwin Grant. She lived at 470 Beacon and then at 220 Commonwealth. On October 1, 1951, Edna Grant was arrested and charged with arranging for illegal abortions, working with three physicians who also were arrested. On November 15, 1951, Edna Grant transferred 296 Marlborough and her other properties to a trust she established for her benefit with Anna Louise (Day) Hicks as trustee. 294 Marlborough changed hands and on February 8, 1952, was acquired by Harriett Lorraine (Kirtland) Cory, the widow of Frederick Hurlburt Cory. She remarried soon thereafter to Emil Johnson. On June 6, 1952, 296 Marlborough was purchased from H. Lorraine Cory Johnson by Matthew Joseph Malloy and his wife, Ione Wilkinson (Lohr) Malloy, who operated it as a lodging house. They lived in Newton. 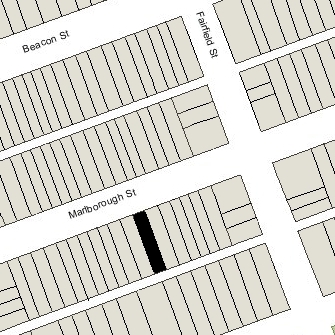 In the mid-1930s, the Malloys had founded Stratford School, located at 128 Commonwealth. In the 1950s, it merged with Chamberlayne School, located at 130 Commonwealth. On February 10, 1954, H. Lorraine Cory (having separated from Emil Johnson) foreclosed on the mortgage given by the Malloys when they purchased 296 Marlborough and took possession of the property. She continued to operate it as a lodging house. 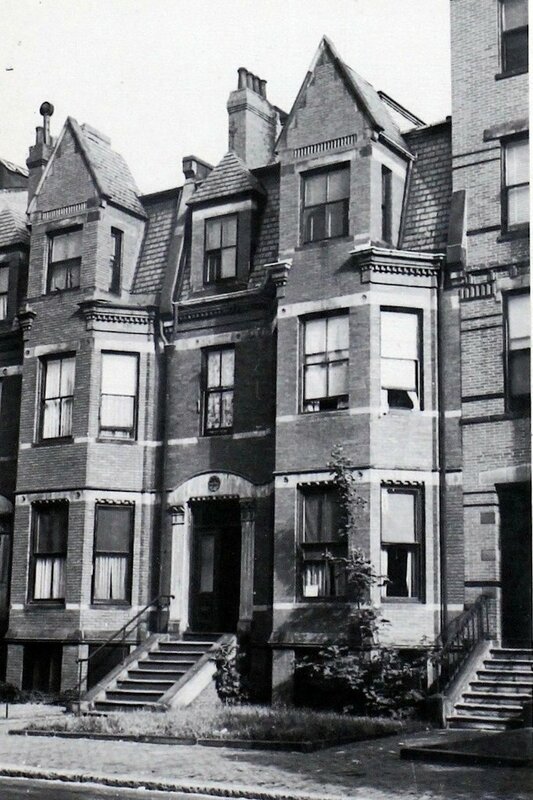 The property changed hands and on May 3, 1961, was purchased by attorney Daniel J. Finn, as trustee of the Daniel J. Finn Trust He and his wife, Mary (Ross) Finn, lived at 294 Marlborough. In March of 1962, he filed for (and subsequently received) permission to convert the property from a lodging house into seven apartments (which he asserted was the use at the time he purchased the property). On January 25, 1995, he transferred the property to his children — Deborah R. Finn-McGinnis, Daniel J. Finn, III, Jeffrey R. Finn, Kevin R. Finn, and Kathleen V. Finn. On the same day, they transferred the property to Deborah Finn-McGinnis and Daniel J. Finn, III, as trustees of the 296 Marlborough Street Nominee Trust. On August 1, 2011, 296 Marlborough was purchased from Deborah R. Finn-McGinnis and Daniel J. Finn, III, by the 296 Marlborough Street LLC (Brent A. Berc, manager of record). 296 Marlborough remained an apartment building in 2017.